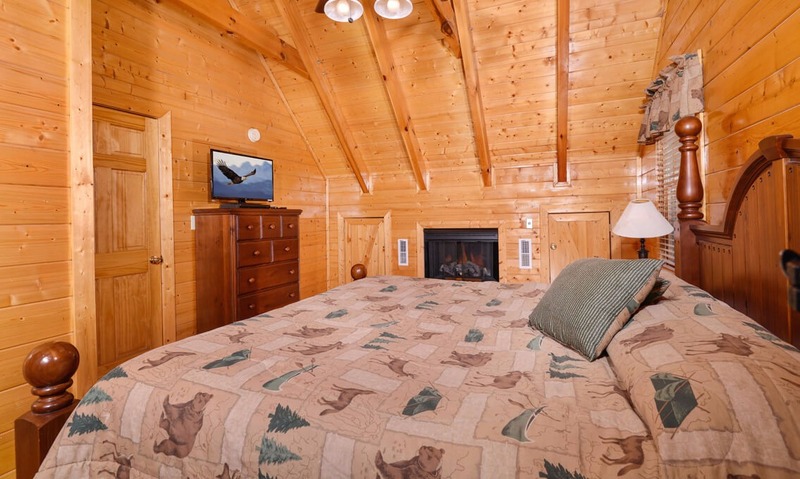 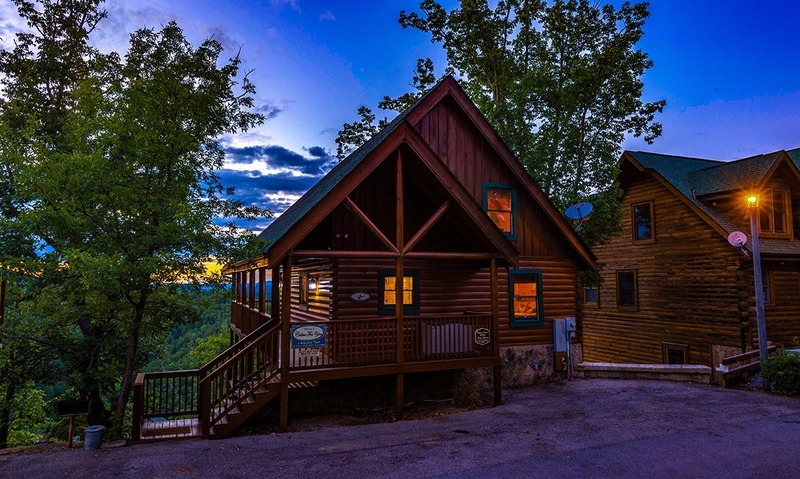 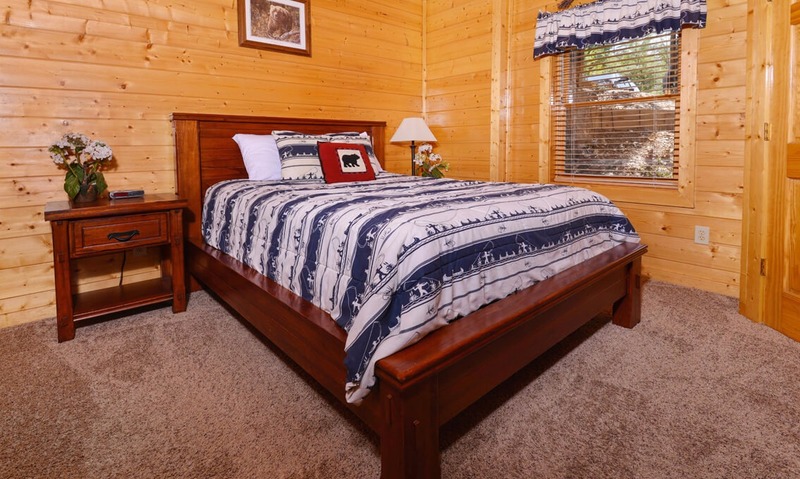 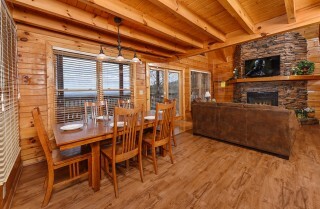 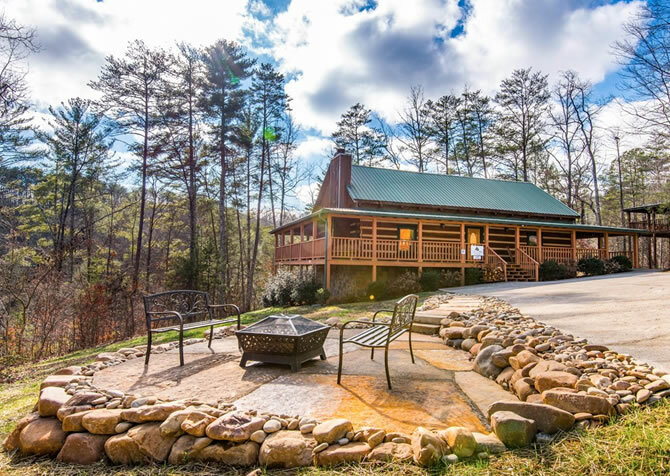 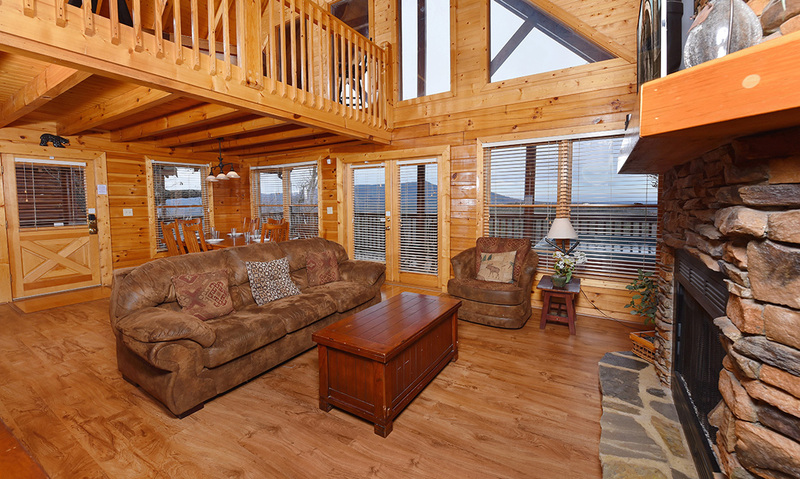 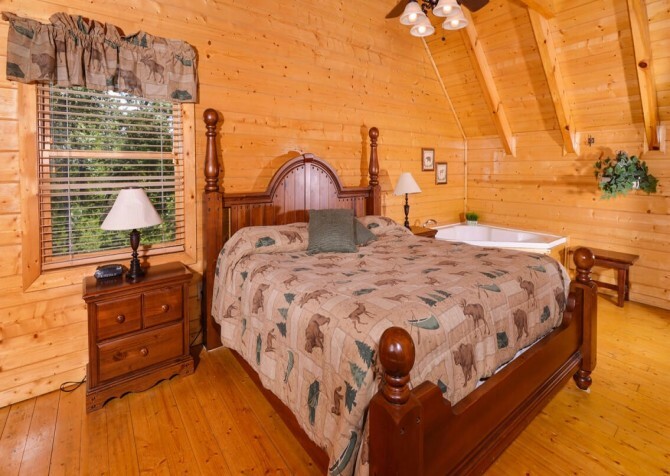 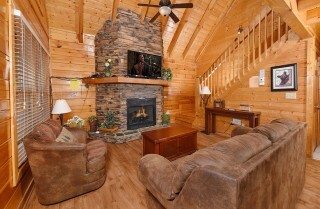 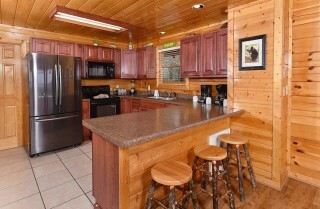 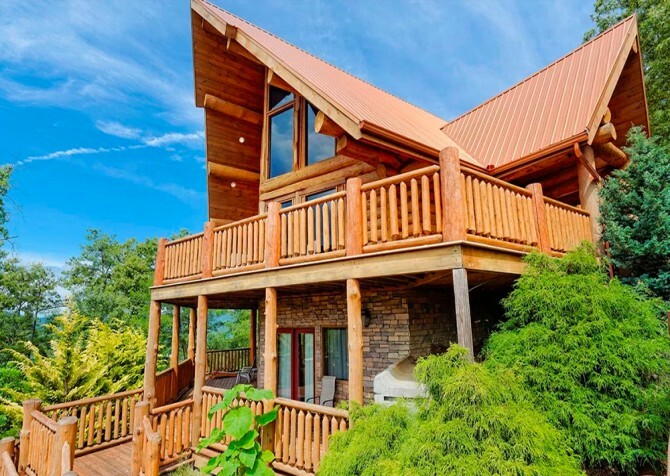 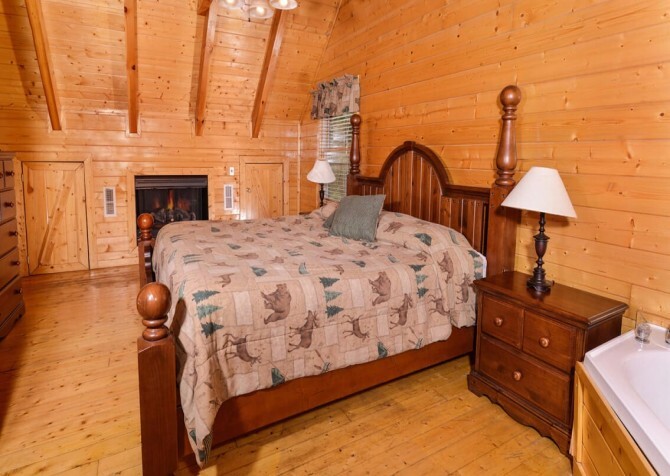 Located in scenic and exciting Pigeon Forge, Tennessee, Black Bear Ridge Mountain Views is a beautiful 4-bedroom, 3-bathroom, pet-friendly cabin — great for group getaways with family, friends, and Fido! 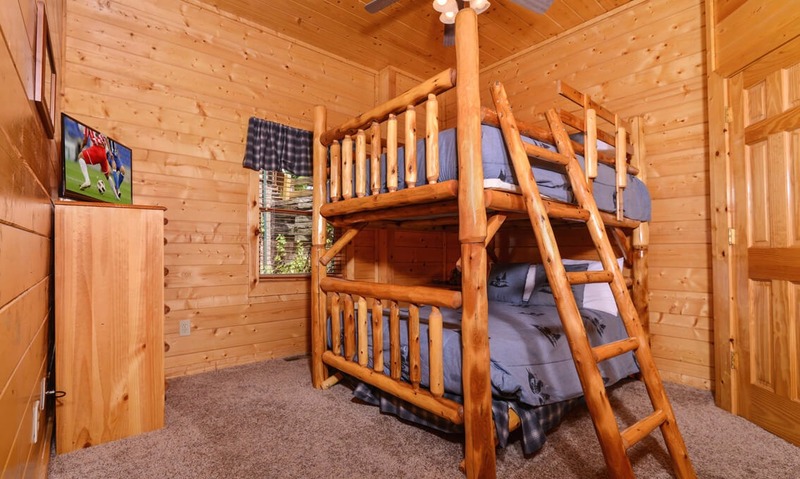 With room for 14 guests, this luxury property offers plenty of space for the whole crew, a fully equipped kitchen for homemade meals, and lots of amenities to keep both kids and adults entertained and comfortable. 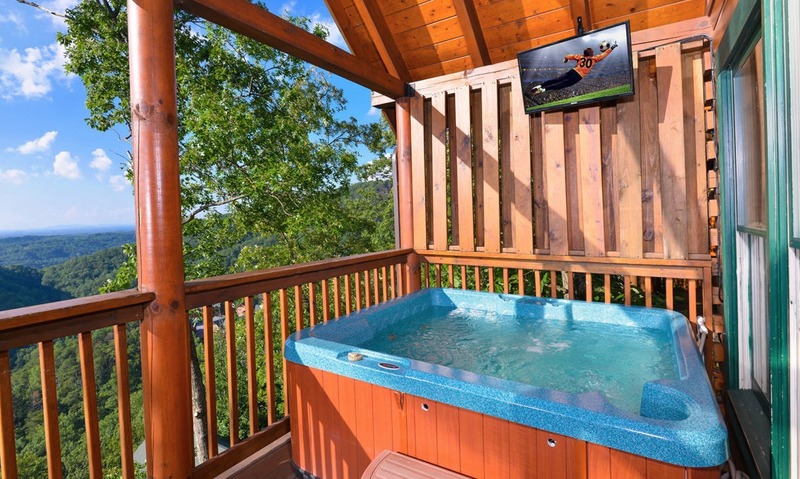 Between the game loft, outdoor hot tub with TV, private bedrooms, indoor jetted tub, home theater with Blu-ray player, and multiple decks with gorgeous mountain views, you'll find lots of places to relax and unwind on your unforgettable Smoky Mountain vacation. When you want to watch TV, enjoy a good read by a toasty fire, or take a cat nap, head to the cozy living room. 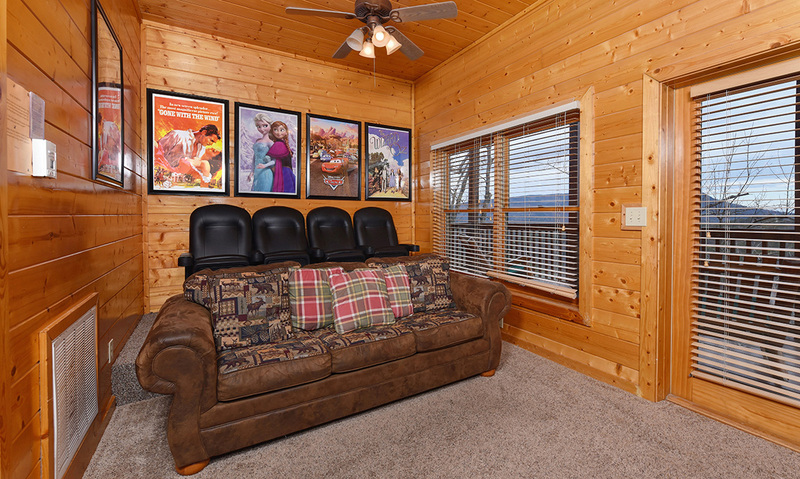 Featuring a plump sofa and matching arm chair as well as carpeted flooring and a flatscreen TV, the living space at Black Bear Ridge Mountain Views is the epitome of comfort. Let the little ones roll around in play while you chat with friends or get on the floor yourself and unleash your inner tickle monster on the toddlers. A beautiful showpiece in the room, the stone gas fireplace adds a touch of rustic charm. 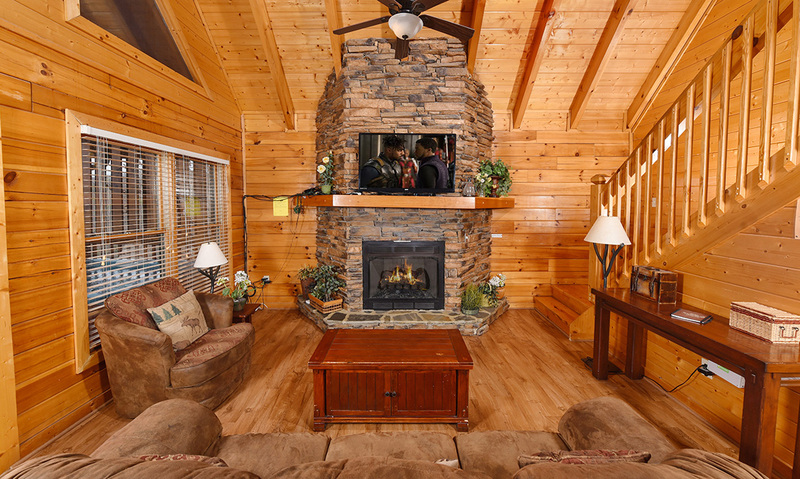 Get a fire going on cool evenings to complete your cabin experience, play card or board games on the coffee table, and enjoy serene mountain views through the many windows throughout the space. 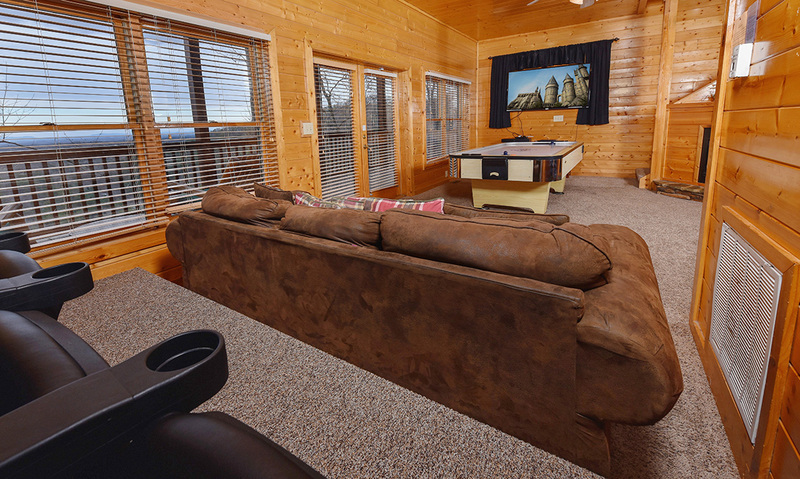 Want a closer look? Head through the glass doors to the spacious deck to soak in the peacefulness of the Great Smoky Mountains. Boasting an open floorplan throughout the home, Black Bear Ridge Mountain Views keeps everyone connected with the kitchen and dining area just off the living room. 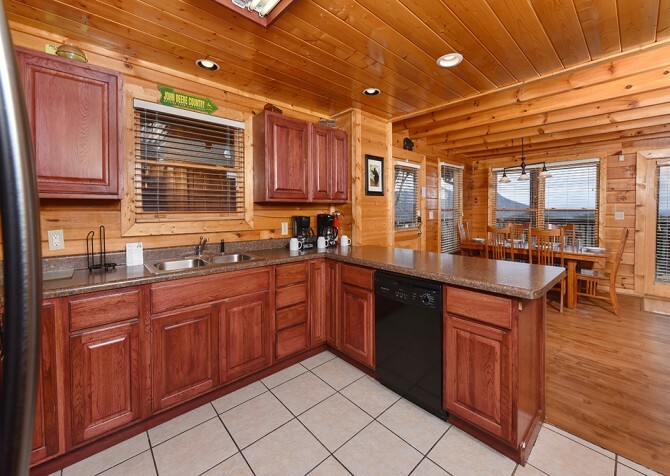 Fully equipped for homemade meals, in-between refreshments, and midnight snacks, the kitchen offers sleek black appliances — including a microwave, refrigerator, oven, coffeemaker, toaster, and blender — a stainless-steel double sink (with a sprayer for washing vegetables…or playing practical jokes), and bar seating for 3. 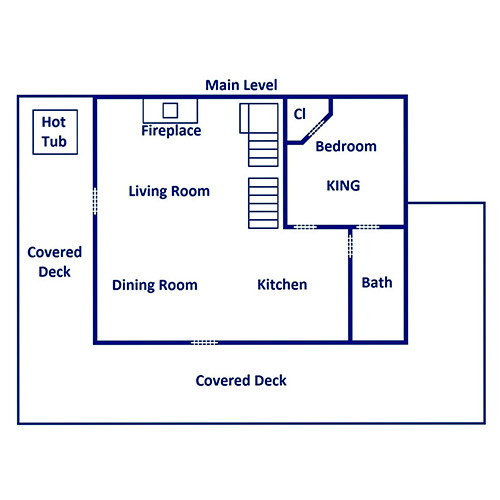 Whip up a hot breakfast, lunchtime spread, or dinner feast in a flash with provided cookware, dishware, utensils, mugs, and more! Plus, the dishwasher would be more than happy to clean up the mess, and cooking at the cabin is a great way to save some money while on vacation. 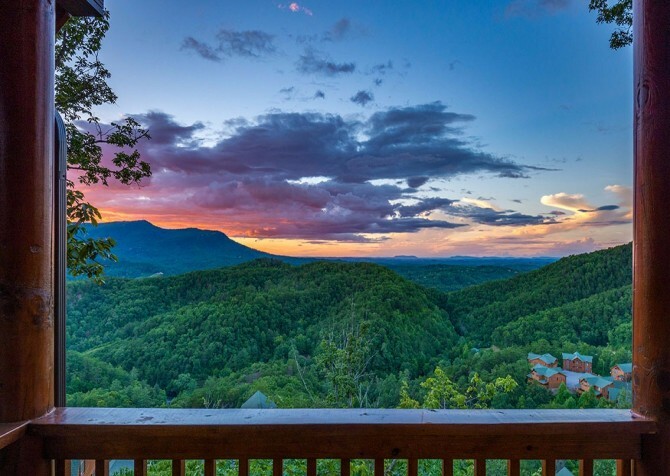 Gather with family and friends for scrumptious meals, stimulating conversations, or arts and crafts in the charming dining area of Black Bear Ridge Mountain Views. Harboring a dining table for 6 with a warm wood finish and bright windows all around, this space is great for planning the day’s activities in town. And with seating in the living room and at the kitchen bar, everyone can chime in with ease. Ready to enjoy an epic film on the big screen TV? Head to the movie room with a Bose theater sound system, Bu-ray player, theater-style seating, and a comfy couch for the ultimate movie-watching experience. Slip into your pajamas, pop tons of buttery popcorn, get cozy, and press play! There’s even a gas fireplace and large windows with awesome mountain views, so you can use this space for a bit of relaxation as well. 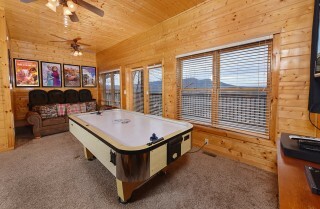 And let’s not forget the air hockey table, perfect for those looking for extra excitement! Up for more games? Venture to the rec loft upstairs, featuring a nostalgic 60-game arcade unit and a classic pool table. 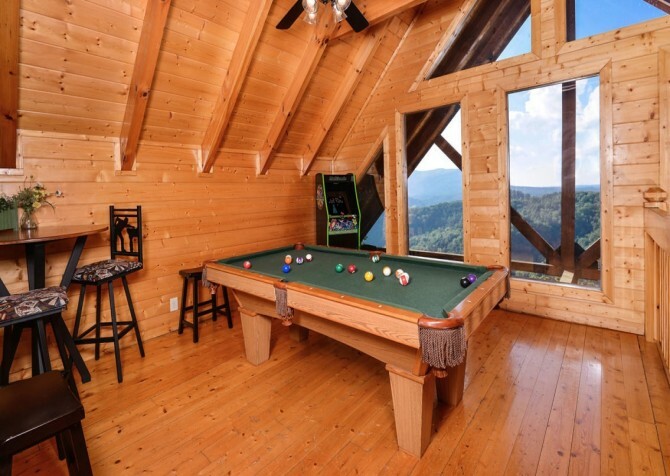 Play for hours on end with your bestie, beat your siblings’ high scores, and unwind with a cold one and a game of cards at the pub table for 2. If the fun competition gets too heated, cool off under the ceiling fan. 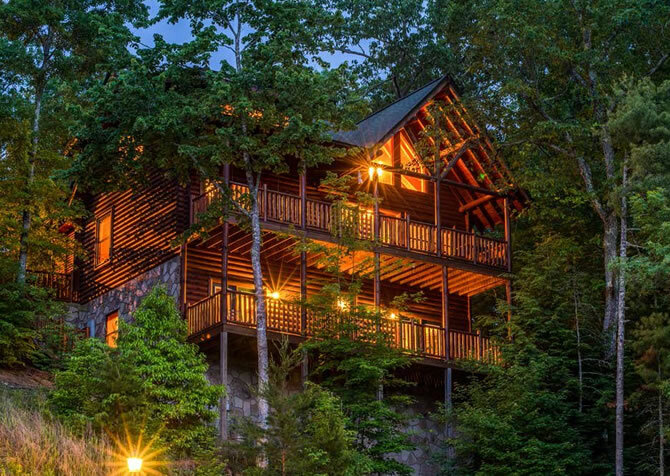 Best of all, enjoy top-notch Smoky Mountain views pouring in through the huge windows! 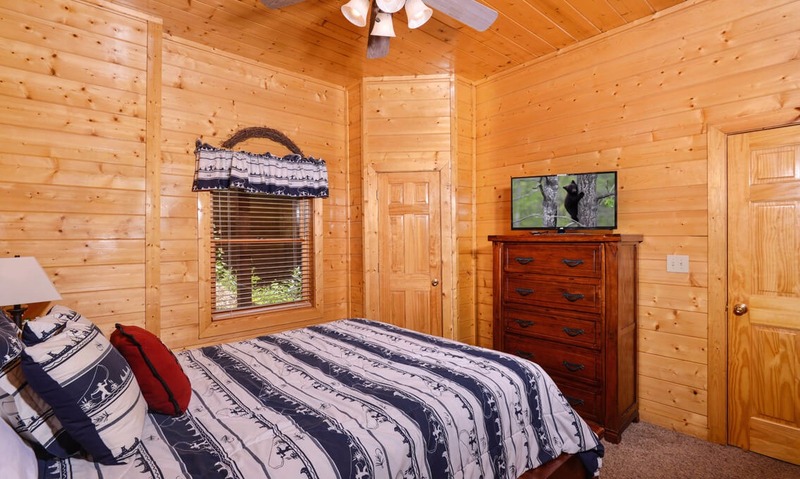 Each of the 4 bedrooms in Black Bear Ridge Mountain Views features a comfortable bed, flatscreen TV (some even have built-in DVD players! 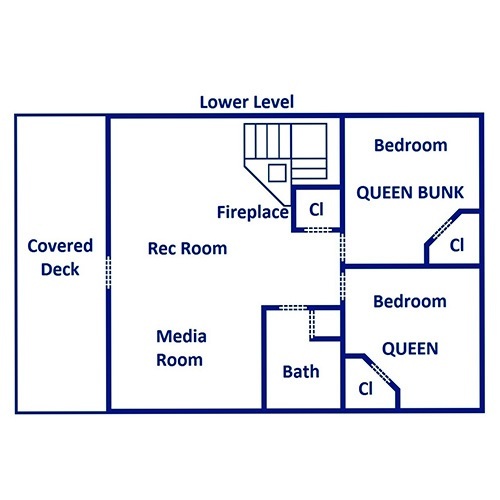 ), and a private space to rest. In all, you'll find 2 king-size beds, 1 queen-size bed, 1 queen bunk, and 2 queen sleepers — plenty of room for 14 guests. And the luxury master suite even has its own electric fireplace and a relaxing jetted tub for romantic evenings. 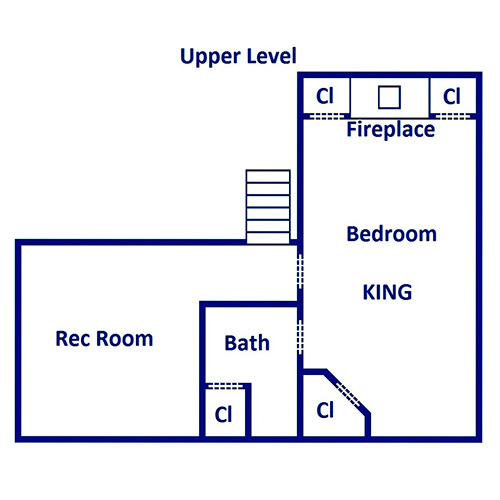 There are also 3 full bathrooms throughout the home, keeping convenience close at hand. Along with the fantastic indoor areas, the outdoor spaces at Black Bear Ridge Mountain Views allow you to enjoy the tranquil beauty and natural peace of the mountains. 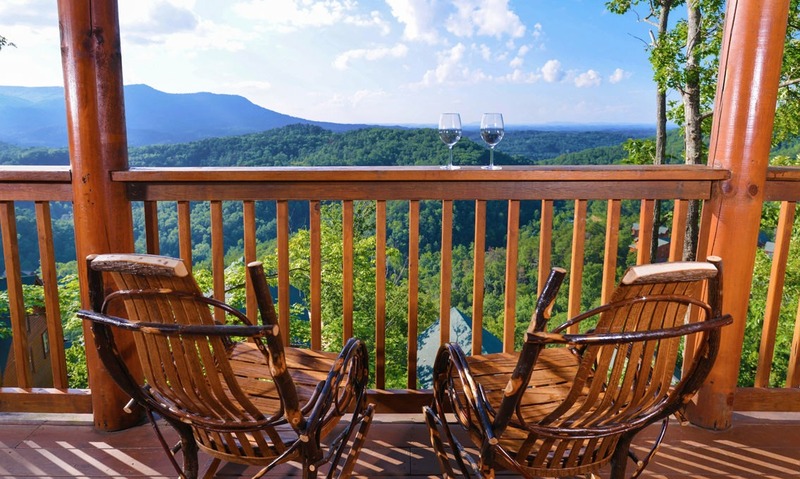 In the morning, sip a cup of coffee while you sit back in the cushioned rocking chairs with incredible views and have a glass of wine under the stars every night. 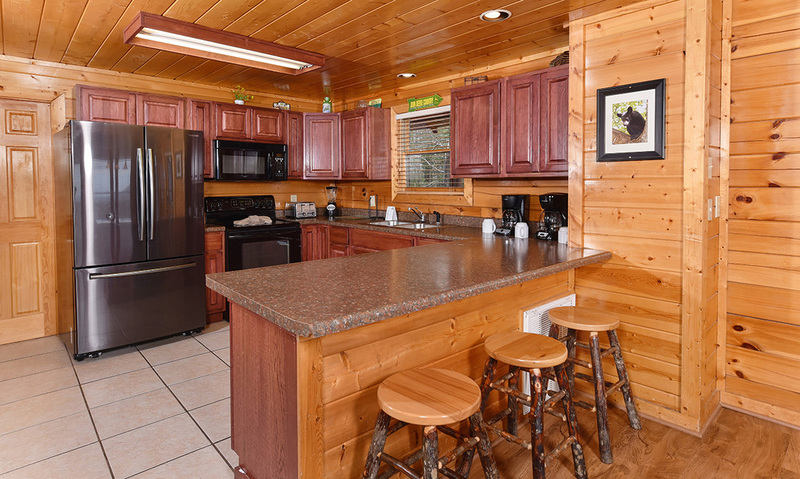 There are even small tables where you can keep savory snacks or sweet treats close by or enjoy an outdoor meal, fresh from the charcoal grill! Want to soothe those tired muscles after a long day in theGreat Smoky Mountains National Park? Hop into the bubbly hot tub and take a relaxing soak. 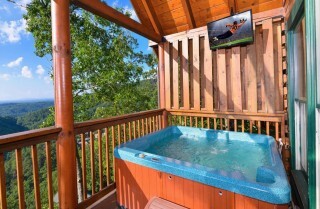 There’s even an outdoor TV so you can watch your favorite shows as you unwind. And when you’re ready to paint the town red, rev up the motorbikes and pile into the cars with ease in the paved parking area of this motorcycle-friendly cabin. 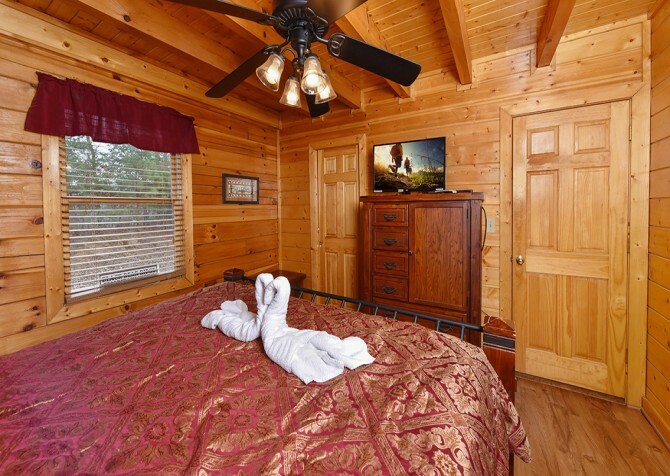 Black Bear Ridge Mountain Views boasts a long list of amenities for guests, and we still have a few more to share! Use the high-speed wireless internet to see what events will be going on during your trip and take advantage of the washer and dryer on longer stays. 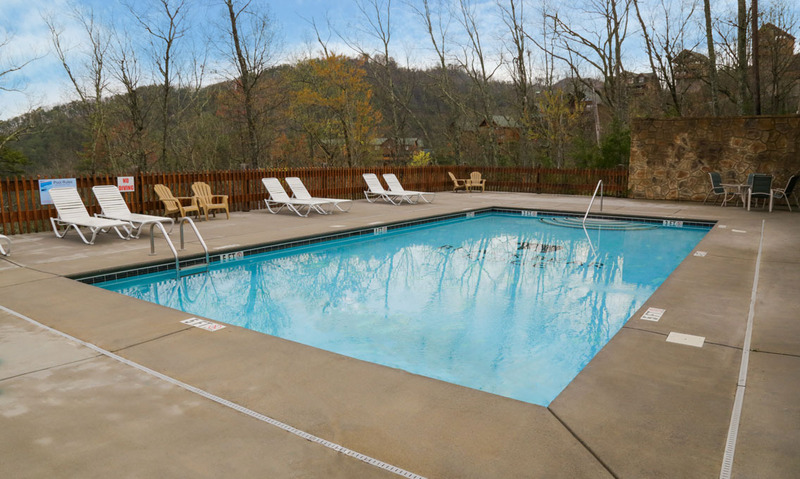 Additionally, Black Bear Ridge Resort offers community amenities, including a wedding chapel where you can purchase daily pool passes for summer swims. Perhaps best of all, this luxury cabin is pet-friendly, meaning no more pet-sitter searches or sad puppy faces! 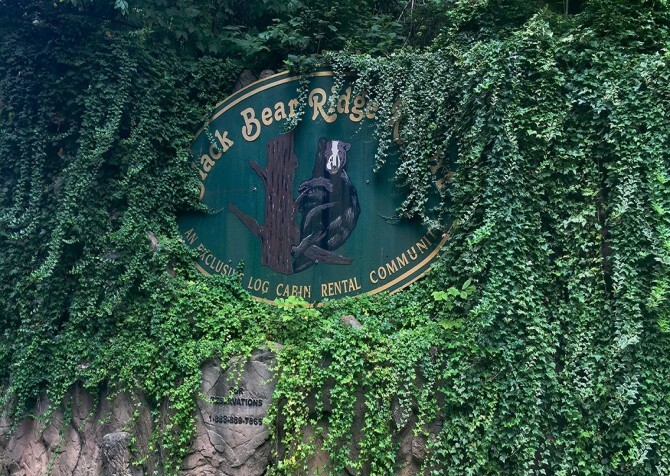 Black Bear Ridge Mountain Views is located just over 5 miles from the heart of downtown Pigeon Forge. This Tennessee city is home to dozens of great restaurants, unique shops, and fun attractions to keep your entire group entertained, from eateries spanning the globe to exhibits focused on local history and art to amusement parks filled with daring rides! Fly through the trees and down the hill up to 27 miles per hour or take things slow and enjoy the ride as you control the speed on the Smoky Mountain Alpine Coaster! 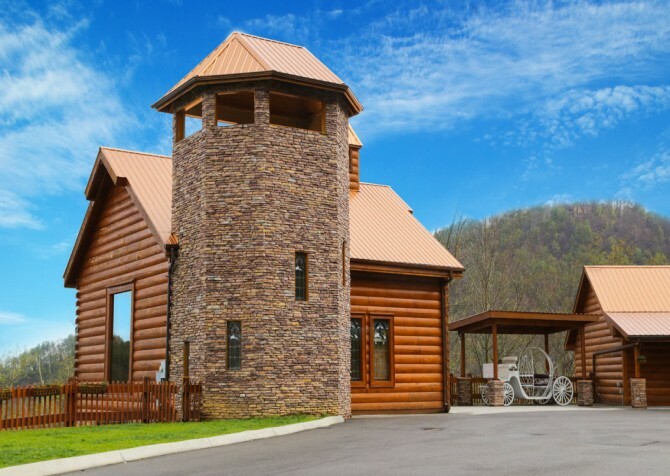 Entertaining and educational, WonderWorks has hands-on exhibits and activities for kids of all ages —you'll be amazed at the illusions and puzzles you find here! 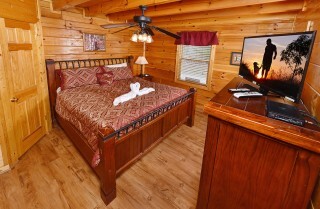 With ingenious rides and spectacular shows, Dollywood is great for both kids and adults. Hop on the roller coasters or sit back and enjoy the exciting musical performances for a fun day in the Smokies. 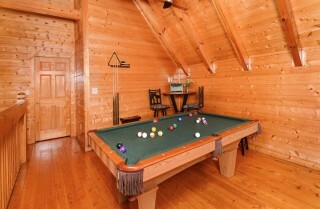 *Community pool access is not included with this cabin. 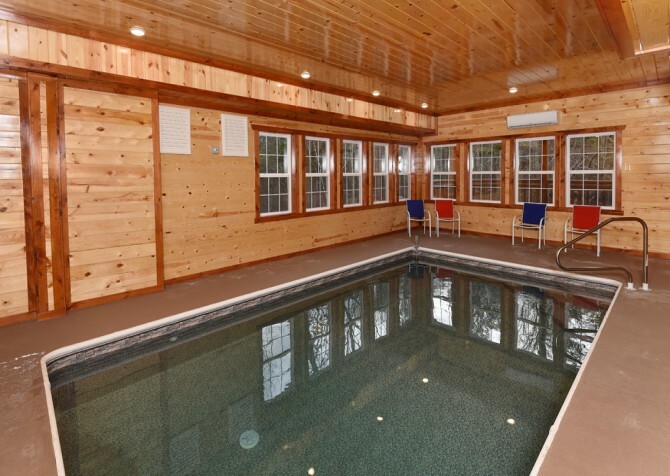 A pool pass can be purchased for daily use. 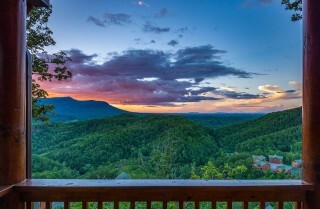 "Breathtaking view. 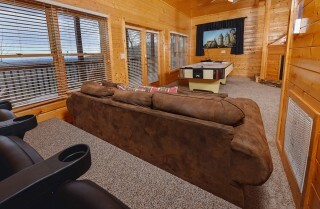 Everything was as promised. Very clean. 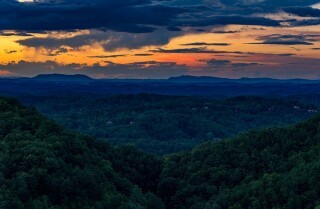 Make sure you have a strong transmission because you are right at the top of the mountain! 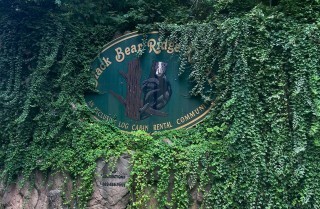 Everything we wanted to do was in close range. 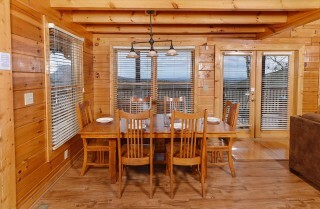 We cannot wait to return to this cabin."